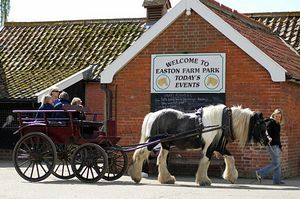 Easton Farm Park was set up in 1974 to offer family fun and education in the countryside. The founders wanted to give everybody the opportunity to learn about the countryside at first hand. Easton still remains an ideal place of learning for families and schools in a rural setting in the Deben river valley. The entry price includes half hourly activities during the day, including pony rides, pony & cart rides, train rides, hug a bunny, egg collecting, meet a Suffolk Punch horse and seasonal activities like meet the baby animals. Please call 01728 746475 for details on our educational trip options, educational tool kit and self-guided activities. The Barmy Barn Cafe & Riverside Cafe offer a range of delicious foodie treats and child-friendly menus. There is also an outdoor and indoor picnic area (although not heated). There is wheelchair access around the Park. We welcome well behaved dogs on leads.